The law firm of Rogers, Hofrichter & Karrh, LLC. was founded in 1993 and is located in Atlanta, Georgia. We provide services to disabled people throughout Georgia and the Southeast. The mission of Rogers, Hofrichter & Karrh, LLC is to provide the best representation, often involving complex litigation, for disabled individuals and employees in claims involving Social Security Disability, Workers Compensation, and employer-sponsored Long Term Disability plans. Our law firm handles all types of disabilities, illnesses, conditions and injuries, including, specifically, the tougher issues which most lawyers will not tackle such claims involving chronic fatigue syndrome, fibromyalgia, sickle cell, cancer, mental illness and complex brain injuries. Our attorneys represent clients in every level of state and federal courts. We are very active in state and federal bar associations and provide counseling to local support groups for various diseases and conditions such as chronic fatigue syndrome, cancer, diabetes, mental illness, fibromyalgia, paralysis and brain injuries. We also conduct several seminars annually for attorneys and health care specialists who practice in this area. We are proud to serve as the Chairman of the Social Security Section of the Georgia Trial Lawyers Association and on the Executive Committee for the Social Security Section of the American Trial Lawyers Association. 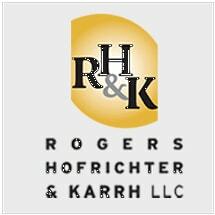 Rogers, Hofrichter & Karrh, LLC. stays abreast of the current trends and changes in litigation, case law and legislation by utilizing state-of-the art technology with full Internet access. We have an on-site library that houses the leading treatises and publication in the areas of Social Security Disability, Workers Compensation, and Long Term Disability. Our staff consists of experienced professionals with many years of service in the field of disability law. We utilize cost effective methods to provide services in a timely, client-oriented manner and ethical, friendly and professional environment. We focus on each client's background, needs and goals, and we are committed to responding promptly to telephone calls, to reporting on cases regularly, and to minimizing and eliminating risk by informing clients of significant changes in the law. Our attorneys possess high academic credentials and maintain strong community ties. We are very active in local charities, government and chambers of commerce. Our members have been on the Board of Directors for local homeowners associations, Kiwanis, Rotary, Chamber of Commerce and have served in various capacities as president, vice president, secretary and treasurer for local organizations including Kiwanis, Chamber of Commerce and the local bar association. The foundation of our practice rests upon the simple principles of dedication to quality, understanding of the law, trust, honest, and hard work.